I realize that since we are only three days into 2012, everyone’s resolutions to eat less sweets is probably still going strong. 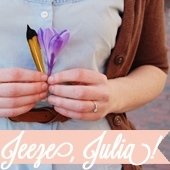 However, because I’m a bit behind, you will have to indulge me (ha, get it!). Also, as far as desserts go, these are not that unhealthy and are a great way to use up all those frozen cranberries you bought too much of over Thanksgiving and Christmas. Besides, January and February are the months of potlucks – these are the perfect party dessert: you can can eat them with your hands and are not too messy. I came to this recipe as I did have a bunch of frozen cranberries I wanted to use up and wanted to make something more exciting than cranberry sauce or chutney. I found this recipe in (of course) Moosewood Restaurant Celebrates (I swear they do not pay me). However, as I was ready to roll out the dough, I realized in a panic that the one pie pan I have was currently being used to bake the apple pie that was still in the oven. While I contemplated running to the store to pick up another pie plate, I decided instead to use muffin tins and turn the tart into mini-tarts. 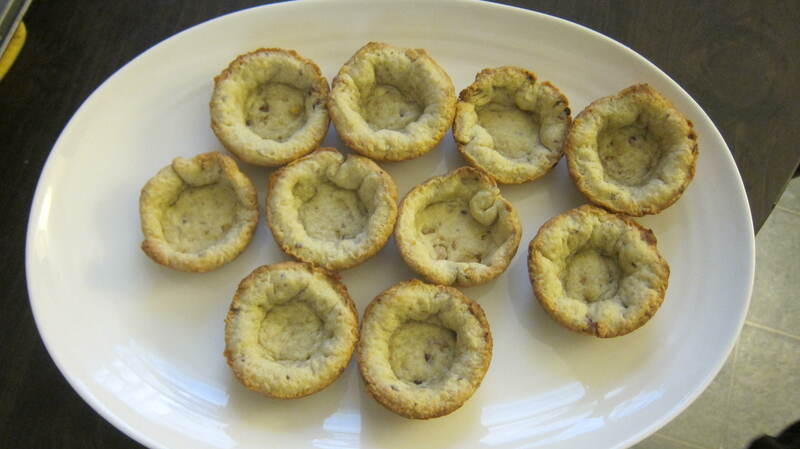 This recipe makes exactly ten muffin-sized mini-tarts. Mix the flour, sugar, butter and salt in a food processor and process until pretty crumbly. In a separate bowl, mix together the egg, nutmeg and vanilla; pour into the dough and pulse until mixed. Add the almonds (to toast them, layer on a cookie sheet and cook for about 10 minutes at 350F until fragrant and browned). Add a few tablespoons of water to the dough and pulse – take the dough out and form it into a disk about one-inch wide. Chill for an hour in the refrigerator. 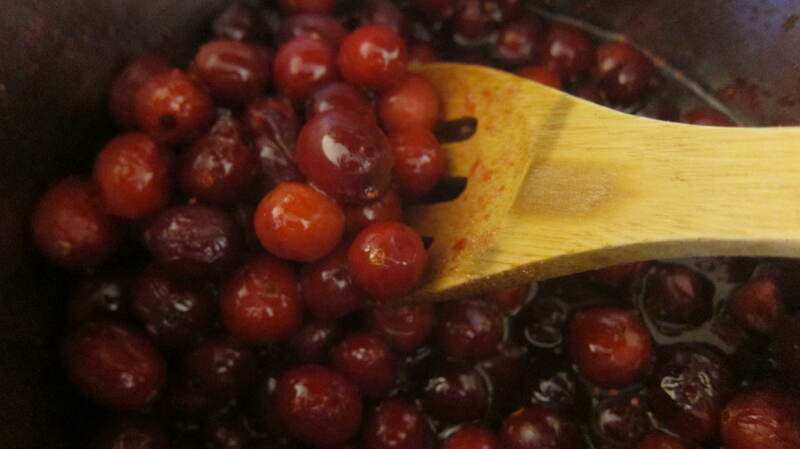 While the dough is chillin’, cook the cranberries in a medium sauce pot for about 5 minutes until they soften. Add the sugar and cook until it is dissolved and the berries are juicy. Pour in the cornstarch mixture and cook until the sauce thickens. Make sure you stir constantly for about 8-10 minutes until sauce thickens. Add the orange peel, remove from the heat. Once the dough is ready, roll it out so it is about one inch thick. Take a large mug and cut out circles that are big enough to fill the muffin tin. Place each circle of dough in the muffin tin and crimp the sides. Bake for 10-15 minutes until lightly browned. Set aside until cooled. Next, melt the chocolate in a double boiler. When melted, pour about half into the bottom of each muffin shell. Spoon the cranberry filling into each tart until evenly distributed. 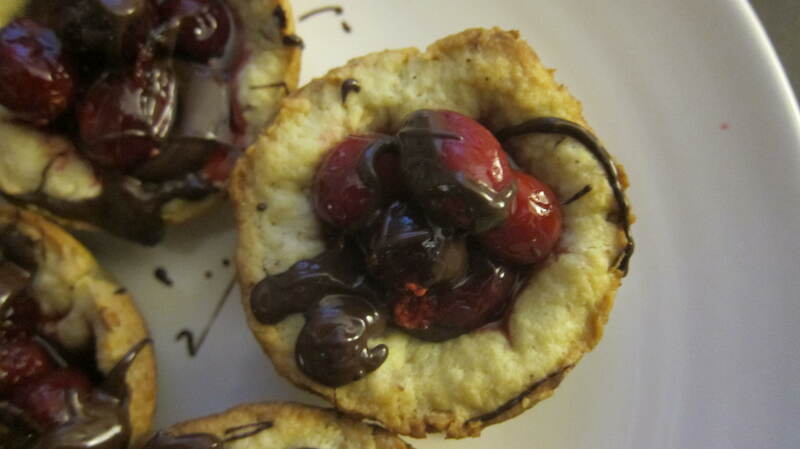 Take the remaining chocolate and drizzle over the cranberries. Let the chocolate harden and store in a tupperware in the refrigerator. 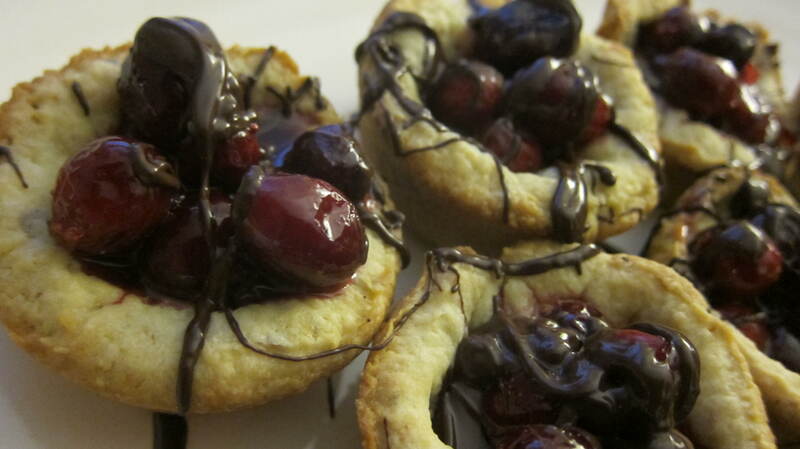 These tarts held up well for more than a week. 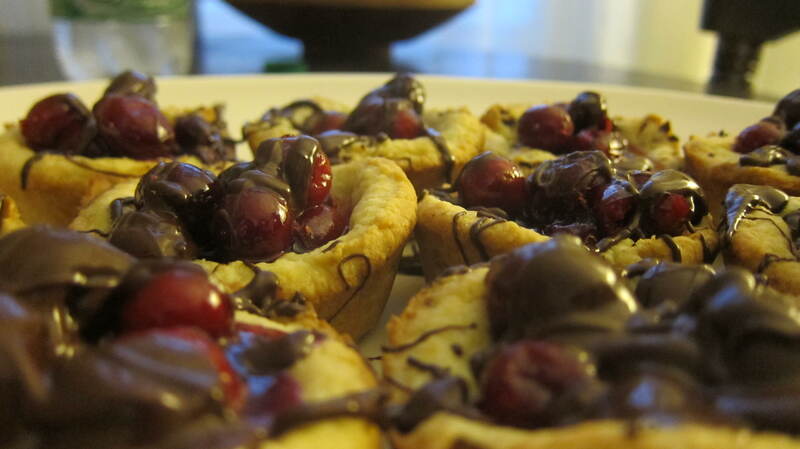 This entry was posted in Food & Cooking and tagged Baking, Chocolate Cranberry Mini-Tarts, Chocolate Cranberry Tart, Christmas, Moosewood, Muffin. Bookmark the permalink.